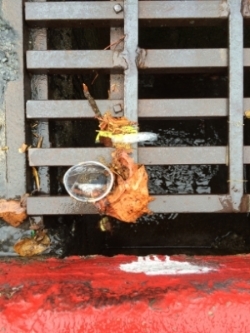 Broken Pieces — There is no "Away"
Here's a small trawl from my brief, rainy, dog walk around San Anselmo this morning. I like the juxtaposition of the intact coffee lid with the "run-over" coffee lid just below it. OH, and the plastic "string" that attaches clothing tags like the adidas one you see above? - I've been saving all of those pieces from our household (in a jar) to see how many a typical family of four uses in a year - ridiculous little things.